This is apretty common error seen in many windows phones and ahs been reported by many users while using Marketplace and other internet services are normally functioning. It has been reported in all devices be it windows 7.5, 8.0 or 8.1. According to Microsoft this error code 805a0193 may also occur when you try to connect to a Wi-Fi network, or if you have an incorrect ISP configuration or invalid network settings. As the error is occuring when you are trying to downlaod apps with the help of WiFi connection and it is not seen when downloading with 3G or mobile network connection. There are some suggestions of changing the location on your market place app but this is not working as many users from all around the world have reported the same error in the Windows phones be it Nokia or HTC. So here are the possible solutions to the problem which we have tried and also got inputs from amny users from around the world and we are trying to put it in one place to be helpful to the users facing this Error 805a0193 while using Market Place. This trick has helped some windows device owners but not everyone has found this useful so try it out and see if it works on your device. Then change the time to some 5 minutes earlier to what it is at the moment and save it. Now go back to your Market place and try to see if youa re getting the same error or is it fixed. We have seen that the Error 805a0193 has been seen in cases where your personal information section in Microsoft Account is incomplete. The fix to this problem is to fill in the details try again, follow the steps mentioned below to complete your personal info details. Go to Microsoft Account and Log in to your account. Now click on Edit Personal Info. Try to install app from Windows Phone Store and check if the Error Code 805a0193 is appearing or not. Before Rebooting or Resetting your device you have to make sure that you will back up all the data on your device like apps, images, videos, contacts, text messages etc as rebooting your device will erase al the data on your device and you can recover this data if you back up before reboot. Try to install the apps or update to see if it is working or you are getting the same error. This has been a common error from Windows 7.5 and Microsoft has not been able to get rid of it even in Windows 8.1 as some devices are still facing the same issue. so hope that Microsoft gets a permanent solution to Error 805a0193. I tried both methods still getting same error 805a0193. switch on you wifi, connect it to a router. 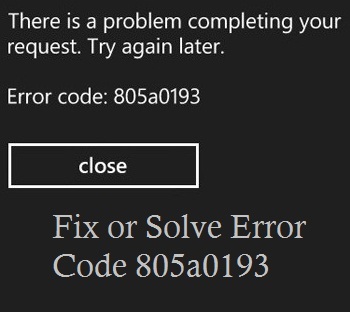 Windows Phone Error Code 805a0193 is back with a bang. I too suffered this on my Windows Phone. Thankfully, the third method of this article helped me resolve this issue.